COLD SLAW.--Wash and clean a fresh cabbage, shave down the head in very thin slips with a sharp knife, and put it into the salad dish; then prepare the following dressing: Stir gradually into a tablespoonful of mustard flour one large tablespoonful of the best olive oil; when the mustard has absorbed all the oil, add a teaspoonful of salt, a little cayenne, and the yolks of two eggs, boiled hard; mix them until they are of the consistency of soft butter; then stir into the mixture a teacupful of cold vinegar, and pour this dressing over the cabbage just as it goes on the table. The cabbage will lose its freshness by standing a long time in the dressing. STUFFED CABBAGE.--Take a large, fresh cabbage and cut out heart; fill vacancy with stuffing made of cooked chicken or veal, chopped very fine and highly seasoned, and rolled into balls with yolk of egg. Then tie cabbage firmly together (some tie a cloth around) and boil in a covered kettle two hours. This is a delicious dish, and is useful in using up cold meats. 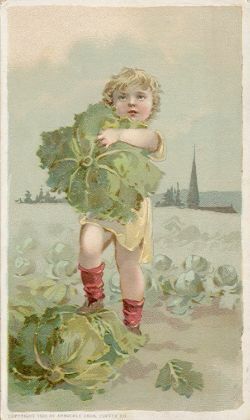 CABBAGE FRIED WITH CREAM.--Chop a quart of cold boiled cabbage, fry it fifteen minutes with sufficient butter or drippings to prevent burning, season it highly with pepper and salt, and stir into it a half a cupful of cream or milk, with a teaspoonful of flour mixed with it; let it cook five minutes longer, and serve it hot.